If you’ve got a name and a niche, you are ready to move onto the next step — setting up a website. This is an easy to follow guide that will walk you through the entire process – step by step. Many people tend to shy away from doing this out of fear. It sounds like a big, scary thing to create a website, but it is rather simple. If you can type, use a mouse and have 30 minutes, you can do it. I’m not going to waste any more of your time, let’s dig into this! Let’s get your site set up!! It may feel like there are a lot of moving parts to set up a website, but they all work together and you can’t operate without all of them. I love using examples to explain things, so I compare blogging to a house. When your home was built, they started with a frame. Then, they added the walls. Once that was finished, they painted it both inside and out. Finally, the put numbers up on the outside so people could find you. And you have your house. Hosting – your frame. Without having a place to hold your site name and details, you have nothing. 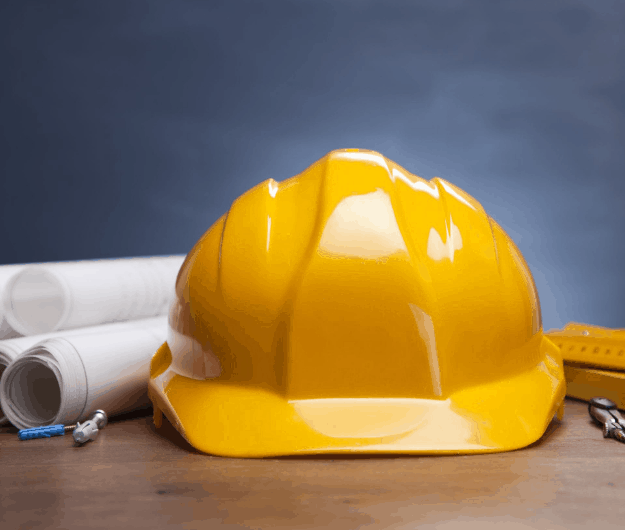 WordPress – these are the walls. This is how people navigate your site and find what they need (like they walk through your home into various rooms). Theme – is your paint and décor. It is how things look when people visit. Domain name – is your address. This is how people can find where you live. Understanding how all these components work together is important to running a blog. You need to know what each piece does when looking at your blog as a whole. Starting today, we are building your house. We will first start with your address, so we know where the house will be built. Then, we are going to build the frame. Finally, we are going to add the walls. By the time you get done today, you will have a house you can find on a map and can walk through the door. It will even have some paint on the walls and a little furniture. You’ll be happy to invite guests to check it out. Ready to get started? Good! So am I!! There are a lot of different hosts available. You may have heard of some of them, such as Bluehost, for example. They are recommended because it is affordable for a new blogger. The thing is, I don’t recommend you use them. Why? Because they tend to have more technical issues that can leave new bloggers, just like you, feeling frustrated. And then, to fix the problem, they want you to purchase more services. That just does not work for me. I’ve seen a lot of hosting companies over the years, but when it comes to new blogs, the only one I recommend is Siteground. They are just as affordable as Bluehost, with less of the headaches and amazing customer support. So, that is what we are going to do today. I am going to walk you through the entire process of adding your domain name to Siteground, so you can have a blog that is ready to use! Like I said above, I only recommend Siteground. So, let’s go there! Click HERE and head over to Siteground and we’ll walk you through the entire process, step by step, to help you get started. When you first get there, you will want to click on Hosting and WordPress Hosting. You will see three options, one of which is Startup. That plan runs $3.95 a month and that is the one you want. Click on Get Plan to start. Next type in the domain name you want to register. This is the name you will call your blog. Type it in and hit enter. The next screens are your account information and payment options. Fill out the top sections as requested. One of the boxes you see is Hosting. You will want to select 12 months here. By doing this, you get a discounted monthly rate and they save the $14.95 set up fee. That means you will pay for an entire year’s worth of hosting today. 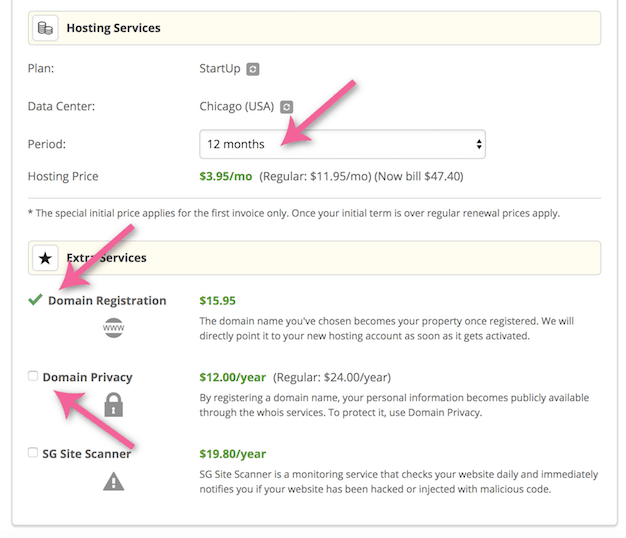 You will also notice that they have checked the domain hosting box for you – and it runs $15.95 a year. You can go ahead and add privacy for $12 a year (I recommend this to keep your private information confidential). Your total costs will be less than $80 for an entire year’s worth of hosting. Once you enter your payment information and hit enter, you’ve got your domain and hosting! WAHOO!!! That means you have a frame built at your address. Now, let’s add some walls!! One thing I love about Siteground is just how easy they make this. You need zero technical experience to do this. Just a few clicks and you are on your way! After you buy your domain and hosting, Siteground should have directed you to the Set-Up Wizard. If not, don’t worry, you can still get there by logging into your account and selecting My Accounts and clicking on Launch Setup Wizard next to your domain name. Under Set up a Website, click on Start a new website and then scroll down and select WordPress. Once you’ve done that, you will enter your email, admin username, and password. Make sure this is something you can remember (that is secure) as it is what you will use to log into your website. When that is done, it will start working to install WordPress. And that’s it! You’ve just added WordPress to your site! Let’s log in!! Now that you have a site, you can log into it and start looking around. You should have received an email from Siteground with the link, but you can get to it even without that. Your login is your domain name/wp-login.php. That’s it. So, if your site name is https://myawesomenewsite.com, your login would be https://www.myawesomenewsite.com/wp-login.php. Enter the username and password you used to add WordPress and you’re in! You’ve just logged into your website. I know you are excited to look around and figure some things out. But, before you jump in and start blogging, there are a few settings you need to get changed right now. The first screen you see is your dashboard. Along one side you will see Posts, Media, Appearance, Plugins, Settings and more. Don’t get overwhelmed by this. We’ll start with the few things you need to do first. The rest will come in time. Before you do anything with your site, you want to check the settings. That way, you know your site is properly configured so you can work on adding content and promoting it. To start, look in the side menu and find Settings. When you hover over it, you will see several options come up. We’ll go through the sections and settings you need to address right now. Most of these should make sense. I’ll touch on the few you will want to edit. If they are not listed here, then you should leave them alone. Site Title: Enter the name of your site. It should not be your domain name, but the name. For example, mine is Tracie Fobes. That is my site name. Tag Line: If you don’t have one, that is OK. It is not necessary if you do not want to use it. Membership: You don’t want people to sign up for your site, so make sure this remains unchecked. This is different than an email service, so make sure you don’t allow people to register. Date Format, Time Format and Week Starts on: Select what you want it to look like on your site. Make sure you save your changes before moving onto the next section. These settings affect the posts on your homepage and how things look should someone subscribe to your feed through a service, such as Feedly. Your home page displays: If you want a landing page as your home page, you can do so here. I discourage this and recommend people be able to see blog posts right from the beginning — even if they are lower on the page. But, you can play around with this and decide what it is you want to do. Blog pages show: The number of posts you want to see in on each page is here. I have mine set on 2, but you can make this what you want. I recommend anywhere from 2 – 6. You also need to update these settings – especially before you add any content to your site. This is the format of your blog posts. There are options to show the date, such as https://www.mysite.com/2018/11/01/my-awesome-post as well as others. You need the right structure so your posts can get found through search engines. You want to this to be POST NAME. Check that radial button. That means your posts will be https://www.mysite.com/my-awesome-post. Doing this ensures you have already take the first step to proper search engine setup. Those are the only settings I want you to worry about for now. You are now ready to add some customization, additional features and then start writing blog posts! When you click on this menu button, you will see all of the posts you have written on your site. Of course, since yours is brand new, there is not yet anything here. But, as you add your content, you can use this to find prior posts quickly and easily. You can also click on All Posts nested under this heading and also see a full list of your articles. When you want to write a blog post, you will click on Add New under this section (or under +New at the top of the page). That’s how you start writing a post. Categories are how you group your content for your menu. Every post needs a category. You will be adding a menu to your site and the way it works is by pulling up groups of posts by category. So, if you write a post about budgeting, you could add it to the money category. Then, if the next one is a recipe, you can tag it recipes. Now, when you add a Money and Recipes menu to your home page and people click on it, only the articles with those categories will show. Don’t make any yet! Wait until we walk through this a little more so you set them up the right way. Tags work in the same way as categories, so you can use one or the other. Do not use both. Categories are simpler and what is easier for new bloggers to use, so don’t worry about adding tags. Media refers to your image and videos. They are all accessed through this dashboard. While you can upload your images here, you can also do so directly on your blog posts. Your Library is a list of every image on your site. This includes your logo and any images you add. You can search to find the one you need to get the code to add to another place on your site. You can also click on Add New and upload a new image. When you write a blog post, you will upload the image through there. If you have logos and other images you will place around your site, you will add them here. Sometimes, you have something you need to add to your site, such as your About Page, but you do not want it to be mixed in with your blog posts. That is what pages are for. When you make a page, you can write just like you do a blog post, but rather than it being listed with the rest of the blog posts, it is only accessible when you have the link to it. They are used for about pages, privacy policies and other things on your site. There are only two options here – All Pages and Add New. All pages allow you to see every page you have made and Add New is how you add a new page to your blog. Appearance is how things look on your site. This is where you will find a free Theme to use or access one you have purchased. We’ll talk Themes in another lesson during the Profitable Blogging Roadmap five-day course. These are features you add to your site. You may see things in the sidebar of a site such as social sharing icons, a link to their about page, etc. You add these using Widgets. Having a menu on your site helps the user experience. They can find the content they need without having to scroll through page after page. The menu is created by including links to specific pages and categories on your site. Plugins. Glorious Plugins. Plugins are what provide additional features and enhancements to a site. They can include items such as buttons readers can click on to share a post, help with SEO and blocking spam comments. They are a vital part of a good blog, but you don’t want to add everything you see. Be careful with the plugins you select so you only get those you really need to have on your site. 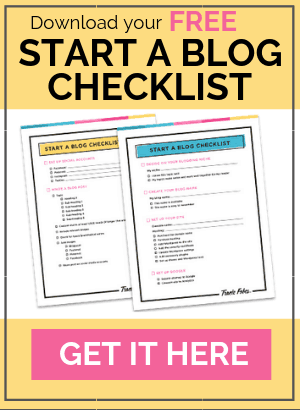 If you are still really new to blogging, I recommend you take my FREE How to Start a Blog Course. You’ll get help figuring out what it is you want to blog about, coming up with a name, setting up your site, making it look the way you want and even getting your very first article published. It is absolutely free of charge (no strings attached). There you go! The simple way to get your site set up and running so you can be on your way to making money! !